The long awaited first Windows Phone 7 device for Verizon has shown up on BestBuy.com. The phone is listed at a price of $599.99, which is a pretty steep price but most likely not official. Best Buy usually lists items that haven’t been officially announced yet at a ridiculously high price for the sake of protecting accidental sales. 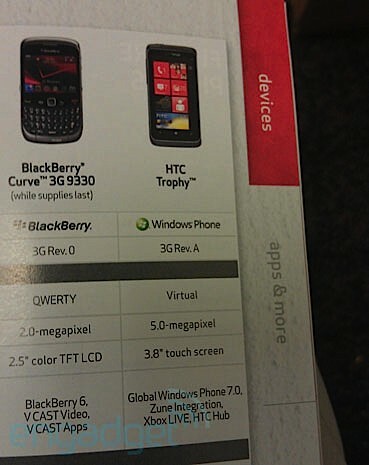 In other sources, Engadget received leaked Verizon documents about the HTC Trophy, and it is listed as a world phone! The fact that these are actual documentation from Verizon shows that everything you see is most likely what you will get. Many users are anxious to have more Windows Phone 7 world phones available. Here’s your chance at another world phone if you already have Verizon as your carrier or plan to have them.